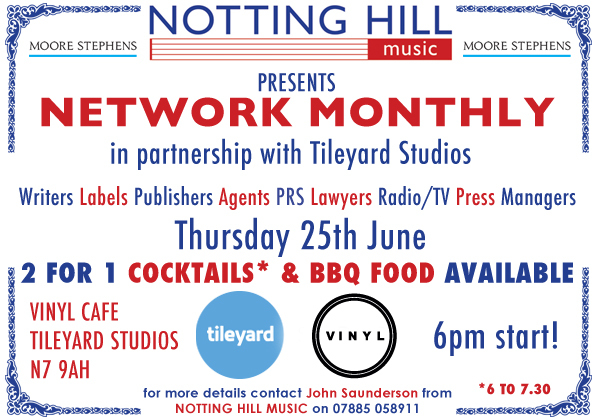 Next Thursday we’ll be hosting the second Notting Hill Music Network Monthly in conjunction with our partners at Tileyard Studios. No guestlist or RSVP, just turn up! There will be a BBQ and nibbles for the first couple of hours courtesy of the accountancy firm MOORE STEPHENS & the first 120 people to arrive get a free bottle of beer! Come and meet writers/managers/lawyers/labels/publishers and loads of other fantastic industry people!